On a recent trip to Las Vegas where I was speaking about accessible and universal design at the Hospitality Design Expo, I had the opportunity to visit the trade show and see the latest products. Here are some of the newest decorative grab bars, including some with special properties to make them healthier and safer to hold. When I first saw a photo of the Great Grabz (www.GreatGrabz.com) Wave grab bars, I knew I wanted to include them in my new national demonstration home, the Universal Design Living Laboratory (www.UDLL.com). The innovative wave design added an artistic element, as well as full function as a grab bar. A research test at the University of Buffalo showed this Wave grab bar to be more ergonomic than a straight grab bar due to the angle of a person’s forearm when gripping the bar. They also make straight towel bars that are sturdy enough so they can be also used as grab bars. The Wave grab bar is made of aluminum and is available in polished brass, polished chrome, polished nickel, oil rubbed bronze, matte oil rubbed bronze, wrought iron, satin nickel and custom color finishes. It can hold over 250 pounds of force and has adjustable mounts, which is great for bathroom remodeling projects. This allows the installer to slide the flanges along the bar in order to align with the wall studs. The Wave is available in 24-inch and 36-inch lengths and sits an inch and a half from wall to bar. These grab bars are also a healthy product because of the recent incorporation of Saniguard in the manufacturing process that helps inhibit bacteria growth. Saniguard is a permanent, inorganic antimicrobial treatment that utilizes a silver ion technology to inhibit the growth of bacteria, molds and mildews that can cause odors, staining, and product deterioration. In addition, this epoxy powder coating actually adds a layer of protection to the decorative finishes as well as eliminates finger prints. In April 2009, Kohler (www.Kohler.com) introduced the Belay handrail for use in showers. “The Belay handrail was designed to protect the user and enhance the overall beauty of a bath or shower space,” said Michael Wandschneider, marketing manager for bathing products at Kohler. “A concealed installation seamlessly integrates the handrail into the existing tile surround, making it a great choice for homeowners that need the support, but don’t want the look of a traditional grab bar.” This handrail subtly recesses into the wall, serving as a surface anyone can easily grip. The handrail is intended for installation in tile walls. It is made of two aluminum extrusions, one creating the grip rail, and the other mounting flush to the wall. The rail comes in 30 or 54 inch lengths, which can be cut to custom sizes. The handrail can be installed at any height to provide support. It is available in etched silver or nickel, polished silver, brushed bronze and matte nickel. 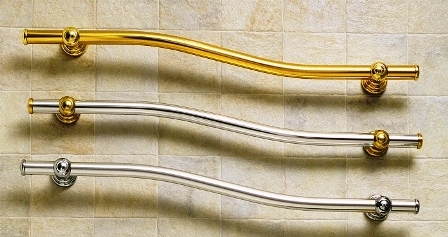 In April 2009, Kohler added the Purist and Traditional decorative grab bars to their collection. These coordinate with their line of faucets to create a unified look in the bathroom. Moen (www.Moen.com) included the Kingsley and Monticello decorative grab bars in their collection, which also match their faucets. These designs include beautiful flanges and finials. Jaclo (www.Jaclo.com) is another luxury grab bar manufacturer who integrates a variety of flanges, finials and finishes in their design of straight bars. Ginger (www.gingerco.com) has several designer grab bars as well as other bathroom accessories. They are available in a wide variety of finishes including: polished brass, satin nickel, polished nickels and matte chromes. Each bathroom project is different and peoples’ tastes in bathroom accessories differ. With the wide collection of grab bar choices now available in the marketplace, bathrooms no longer need to have the institutional nursing home look. 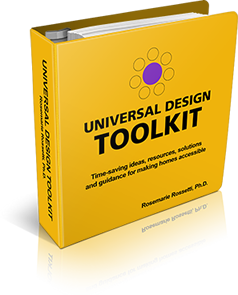 Rosemarie Rossetti, PhD is building a national model universal design home in metropolitan Columbus, Ohio. 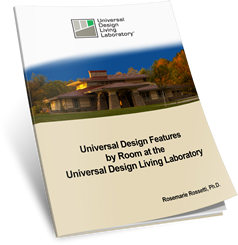 To learn more about the Universal Design Living Laboratory go to: www.UDLL.com. Contact Rosemarie with your ideas for future articles, questions, and accessible home problems she can solve at: [email protected].